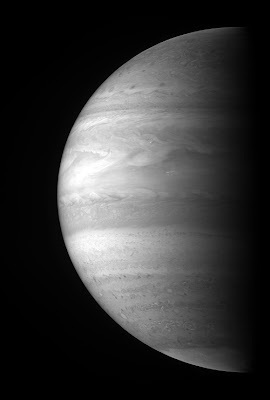 On February 28, 2007, the New Horizons spacecraft reached Jupiter orbit, and took the below photograph. For those unfamiliar with this spacecraft, New Horizons is destined for Pluto and the other small, icy worlds beyond the orbit of Neptune. Neither Pluto nor these worlds have been photographed before, so there is something particularly significant about this mission: it truly represents the final frontier in this, our Age of Exploration of our solar system. (Uranus and Neptune were studied by NASA's Voyager missions of the 1980s; Jupiter and Saturn have been visited even more times--with the Cassini spacecraft presently giving Saturn the most in-depth look we have ever obtained of that planet; see December's National Geographic). As if this weren't exhilarating enough, New Horizons is also the fastest spacecraft ever launched. Upon its launch last year on January 17, it passed the orbit of the Moon in just nine hours. Nine hours! If that doesn't mean anything to you, consider that the Moon is 239,000 miles away from the Earth, and that it took the Apollo astronauts of the 1960s and 70s a full three days to reach it. So, New Horizons has now arrived at Jupiter, a planet which at this particular moment happens to be a waystation along the path to Pluto. It will circle Jupiter just once, using the planet's immense gravity as a slingshot to give it one last boost off to its end goal. How fast is New Horizons travelling? Even travelling at such great speed, it won't arrive at Pluto until... 2015. That tells you something about how far away Pluto is. I think of my parents as having grown up at the dawn of the Space Age, and therefore having had the great fortune of watching its pinnacle with the Apollo missions of 1963-1972. But what many of us don't realize is that my generation has been growing up in a veritable Second Space Age. Those who have been willing to look, have been witness to the first in-depth exploration of Venus, Jupiter, Saturn, Uranus, and Neptune. And this is to say nothing of the astounding achievements of our great space telescopes--especially Hubble--which for nearly two decades now have been making entirely unprecendented observations of stars, galaxies, and a plethora of celestial oddities from quasars to black holes. (The Hubble Heritage Project, since 1998, has been working to keep the public informed of the most awe-inspiring of these discoveries each month). It is said that for the last Apollo mission, just three years after the first landing, the television networks did not even carry live coverage of the event (in fact the remaining missions had already been scrapped by the government for lack of popular support). Far, far too many today make the same mistake of our fathers, who were, at best, blind to the achievement (and at worst, numb to it). Let us resolve not be among these blind.